Aah, the good old days, or were they? It’s easy to look at the past through rose-tinted spectacles, and these photos certainly capture the spirit of a simpler, less regulated way of life, but I for one am glad that some things have changed. Let’s enjoy the photographs for what they are: an historical record of people and their birds in different cultures and different times. My thanks to John. Of all the photos, I love the one of the man training his Japanese Hoso. I’ve credited the source of the photographs where possible. If anyone recognises the other photographs and knows the photographer, I’ll be happy to credit them. Wrong! 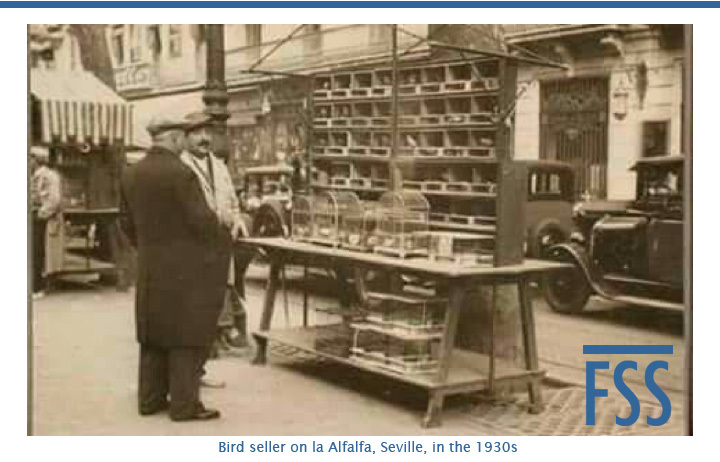 The postcard gives the wrong name for this once animal market in Sevilla. The correct name is Plaza de la Alfalfa, and more commonly known as la Alfalfa (many images available on the internet) As John correctly explains it was closed down as a direct result of the avian flu period… yet should have been closed down much, much earlier for the most obvious of reasons. I well remember John buying that duckling for his little children…we were together on a family/friends group outing – visiting some bird show, what else!! Thanks Ernest, I’ll update the text. Your penultimate sentence confirms my own sentiments about some of the photographs, but captions aside, they are still fascinating . . . and in the past. The good old days indeed: just enter “konijnenmarkt mol 2017” in google pictures. I still feel favored. As a young boy in the 1960’s “Jokke”, the oldest brother of my own mother, took me out catching birds in free nature. My uncle only attended school till 13 years old. Still he knew everything about european birds. He even could name them by their latin scientific name. On his old days, after a stroke, he was rewarded by the university of Leuven for his lifetime achievement in catching, ringing and setting free more dan 1,500,000 birds. Jos Mostmans officialy ringed and recorded for the period 1952 till 2002, 940544 birds of 213 different species. Still an amazing 51 birds on averange each day over half a century, faut le faire! Brit. Birds 69: 355-356 for 1975 records). In an experiment that recorded people’s anticipation of, actual experiences in, and subsequent recollection of meaningful life events, scientists discovered people’s recollection of the event was far more positive than their experience of it while actually doing it. Couple this with ‘Loss aversion’ when we tend to focus much more on losses instead of gains. As our lives progress, while some things change for the better and some change for the worse, loss aversion means that we pay much more attention to the bad things. So overall, we think life is getting worse. Add to that the status quo bias and you get a recipe for glorious nostalgia. The status quo bias asserts that whatever the situation is now, things in the future will get worse. This plus loss aversion, combined with our memory’s tendency to filter out bad experiences from the past, can leave us seeing the world, and our lives, as getting worse.